Waffengang triggers cinematic atmospheres and creates a wartime movie in your head bringing you song after song into special moments of loss and defeat. We experience war moments through the eyes of children on the heartbreaking song Pulverland (with stunning use of elements of the German nursery rhyme "Maikäfer flieg"; we end up on the battlefield again and its countless dying soldiers and horses with "Holterdiepolter" while Der Kommandant throws us back in the icy tormented dark sea for another beloved U-boat song and dancefloor stomper! Just take a deep breath when the diesel engine stops! If "GxSTxPx 4c" deals with all these voices who dared standing up against the unjust Nazi state and got locked in prisons by the German Gestapo, "Josef Ritter von Gadolla" depicts the execution of the commandant of the German city of Gotha who disobeyed by capitulating in front of the marching American army in the last days of WW2. 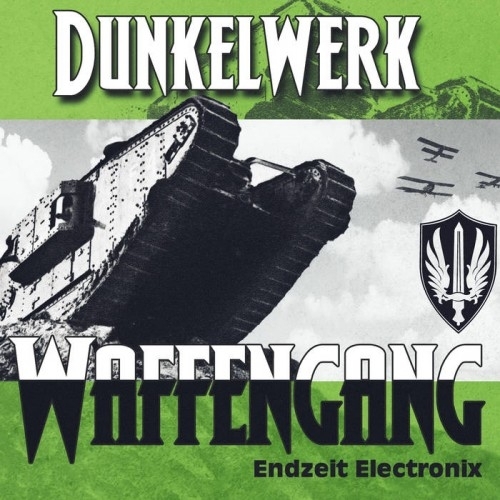 While the song "Battlefield" is about the well-known multiplayer first person shooter series, "Wolkenschloss" is a stomper which might give some hints how the DUNKELWERK bunker looks like... who knows?